READING—Probably more defining than a National Book nomination is Jess Walter's book Citizen Vince winning the Edgar Allen Poe Award in 2005. A Spokane native (and current resident), Walter pens some of the best—and smartest—thrillers in circulation, filled with wry humor, operatic desires and hand-wringing tension. Reading from his latest, Beautiful Ruins. 7 pm. Bend High, 230 NE 6th St. $20-$75. LOCAL MUSIC—The Bend Roots Revival brings together over 80 bands and local artists for a weekend of Oregon-centric, family friendly and totally free fun. This year the event will be held on the Deschutes Brewery lawn with an opening show featuring Ashland's Patchy Saunders at Volcanic Theatre Pub on Thursday. The festival continues through Sunday. 6 pm. Deschutes Brewery, 399 SW Shevlin Hixon Dr. Free. THEATER—In what boils down to an 80-minute argument between two sets of parents, this originally French play by Yasmina Reza spans the spectrum of human emotion, social class and philosophy. After a tooth-losing altercation between the couples' sons, the pairs from different sides of the tracks are forced together to resolve the conflict. 7:30 pm. Cascade Theatrical Company, 148 NW Greenwood St. $15. 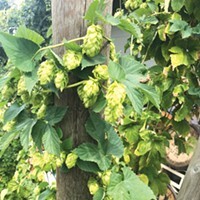 BEER—The rules are simple: Each brew must use at least one fresh hop picked straight from the vine. Yet, somehow the results are crazy varied. With 24 different breweries (all Oregon, thank you very much) showboating their fresh hop brews, the Sisters beer festival has expanded into its fifth year. Noon–8 pm. Sisters Village Green Park. $5/mug, $1/4 oz. tasting. DANCE—A fundraiser for the Sparrow Club of Central Oregon, Swinging with the Stars takes on the model of the hit TV show, "Dancing with the Stars." AKA embarrassing the crap out of local celebrities by partnering them with professional dancers and forcing them to perform excessive ballroom numbers in sparkly costumes. At least it's for a good cause! 6:30 pm. Tower Theatre, 835 NW Wall St. $25-45. ART—An amalgamation of creative intention, Armature, Cinder Cone, Stuarts of Bend and The Workhouse, are all-open late with music, eats, drinks and art for everyone. This summer, the Workhouse has taken up teaching arts classes like recycled scrap metal reworking and art business pitching, only widening the variety of mediums that show themselves in the creative spaces. 6 pm. Old Iron Works, 50 SE Scott St. Free. SINGER—Catchy and haunting, spirited and thoughtful, Justin Froese has a unique and well-trained voice, raw talent that clearly has been exercised into tight form. And he uses that voice to torch through his collection of songs—some precious ditties, others soaring anthems, but through all, the Austin-based singer's voice is the powerful centerpiece. 9 pm. Volcanic Theatre, 70 SW Century. $5. HIP-HOP—If Ferris Bueller made rap music it might sound something like Kalin & Myles, the non-threatening, adorable, prepubescent, puppy dog rappers. Even less threatening than Justin Beiber, with a hip-hop twist, and hooks lifted from every recognizable song of the last decade, these kids are a part of the new teenage wasteland, and are extremely entertaining. Selfies all around! 7 pm. Domino Room, 51 NW Greenwood Ave. $18. SKI MOVIE—If you ever have asked, "Why did someone climb that mountain," or more precisely, "Why did they ski back down it," this is not the event for you. If, however, your meaning of life lines up with ripping down 110 percent gnarly, super-gripped, yahoo, duderiffic, powderified northfaces, this movie is totally blowing up! 8 pm. Tower Theater, 835 NW Wall. $12. PUNK—Deeply talented, Annie Girl can both loudly and subtly rock your socks off. Most often, though, it isn't loud power chords that punch a pack, but sparse, haunting drum beats and Annie Girl's powerful, confident and commanding voice, like a low-key Liz Phair fronting a high-energy Portishead song. 9 pm. Volcanic Theatre, 70 SW Century. $5.